Sorry, it has been a little quite on the blog. I was on vacation last week and training down in Redmond the week before. As a bonus, I've included a good UX design example from my travel last week at the end of the post. Quite a few people asked me about how to post screencasts/podcasts using Silverlight 1.0 RC on their blogs and streaming the digital content using Silverlight Streaming. There are great posts from Catherine Heller and Morten on how to post Silverlight content, but I thought a Silverlight screencast to answer the very question should be very effective. Please see below screencast: a walkthrough tutorial on posting a podcast using Silverlight 1.0 RC. Replace the AccountID with your Silverlight Streaming account ID and replace the AppName with your application name. In my case, it's "PostingPodcast." I passed a nice little town called "Picton" on my way traveling to Sandbanks last week. 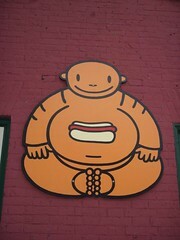 There is gourmet hot dog restaurant called "The Budda Dog" (see their logo below). Isn't it cute and clearly expresses what it is! 🙂 In the restaurant, they have an efficient way of taking orders. 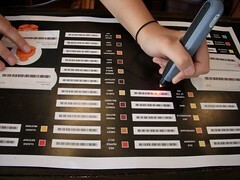 All types of hot dog sauces and toppings have barcodes associated with them, so the waitresses just need to screen the menus to take orders. The orders are shown on the computer right away. Interesting solution, both cheap to implement and flexible to change. You should probably take a look at my second post on the subject called "Silverlight Issues – Solved"
It turns out the original code posted by Tim Sheath does not work in WordPress but will work with a slight modification. This is important info for all WordPress users. Thanks for the update, Morten!